After a legal and creative work, we shortlisted "Akka Venture" as the brand name which represents best our corporate culture and image of Quality. Our corporate identity is also reflected through our logo (triangle) and tagline as explained below. Our brand registration number is 10373764 (INPI). To the Greeks, the triangle is seen as the Delta glyph symbolic of a doorway, the Gate from one state to another, as our clients. Delta, the letter D and the symbol of "Difference" in mathematics, so in what we do!We are keen to make the difference. We picked "Your Partner for Growth" as a tagline reflecting who we are and what we do whether it is for fundraising, M&A, strategic advisory or investor services. Coming up with a good brand name, relevant in image and legally valid, is a challenge and it is the quality of the results in the long run that contributes to build a positive corporate identity. 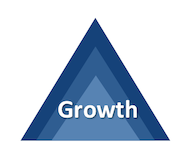 In the end, we evaluated that all these reasons together make "Akka Venture" a special brand name, the triangle the best symbol to represent our positioning centered around - High Growth - and our tagline "Your Partner for Growth" the best line to reflect our identity.